After Neelix, holo-lungs. a hall of mirrors, and space clouds, Star Trek: Voyager finally decides to shape up and get serious when the crew discovers a wormhole that leads to the Alpha Quadrant.That's the good quadrant. Unable to fit through the wormhole, the crew instead tries to use it to send a message to a Romulan ship that, for some reason, is loitering around the other side. This is their chance to get messages to StarFleet and let everybody that they hope is worried about them know what's going on. BUT WAIT! Could they also beam to the other ship through the wormhole?! They've just GOTTA! 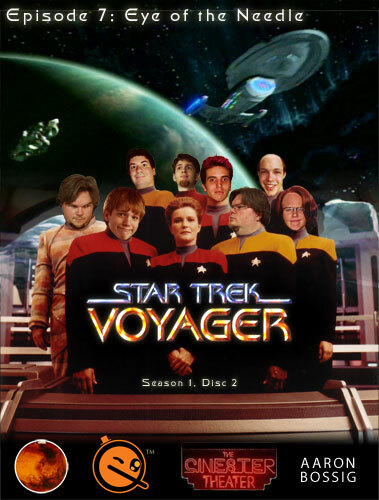 Yes, after six long episodes, the Voyager crew is finally going to make it home! NO DOUBT ABOUT IT! 108 "Ex Post Facto" - Riffed by Ice On Mars - Supposedly coming soon... but seriously, "Eye of the Needle" is the last episode. They are ASSUREDLY going to make it home and the series will end. Sorry, Ice on Mars. Maybe next time.